Dorstone is a soft, unpasteurised goat’s cheese made by Charlie Westhead at Neal’s Yard Creamery in Herefordshire, which sits atop Dorstone Hill, hence the name (it’s also a local village). Charlie was one of the first employees of Neal’s Yard Dairy before he took over their Creamery, then located in Kent, and eventually made it his own and moved it out west. The unpasteurised milk is sourced from a farm over the border in Gloucestershire. To make the cheese, a starter and rennet are added and the milk is left overnight in large buckets to let it set. The rennet in this case is interesting as Charlie chooses to use kid rennet, therefore matching rennet to the dairy animal which is producing the milk (most cheese-makers just use calf rennet). There is some talk of this producing a ‘3D flavour’ but this concept would blow my tiny mind at the best of times; I’m assuming it means it adds to the complexity of flavours rather than you need to wear special glasses to eat it. When the curds are set, they are gently cut and scooped out into plastic mesh sacks and left to drain under their own weight. Salt is then sprinkled over and the curds are put into small moulds. Three days later they are rolled in ash – the alkalinity of the ash helps to neutralize the natural acidity of the cheese which can inhibit ripening. This creates the perfect environment for a Geotrichum rind to grow, which is what gives the cheese its ‘brainy’ appearance after a while. 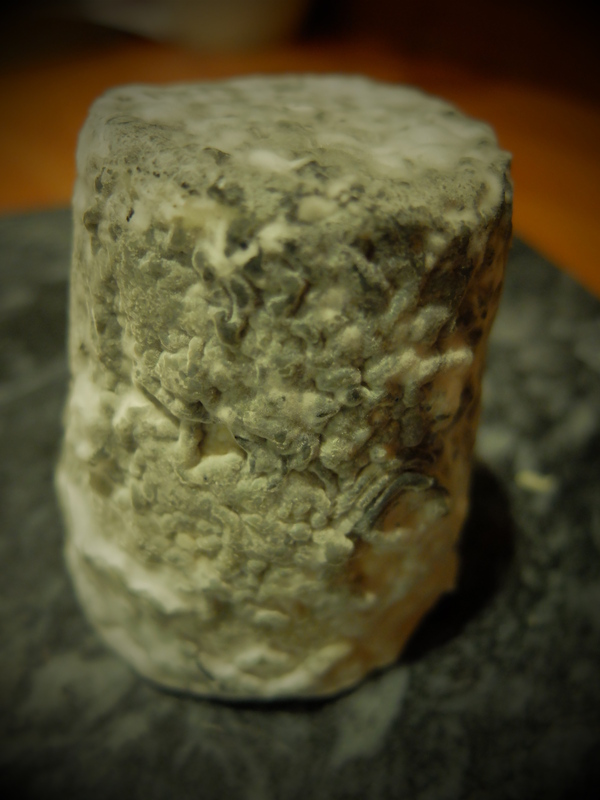 Other moulds start to grow on the cheeses as they age, blue and green spots and white fluffy bits. The cheeses are usually eaten after just two to three weeks. The texture inside the Dorstone was lovely, almost like ice-cream, fluffy yet firm, and the paste snowy-white. The rind slips away from the paste and there’s a slightly liquid layer just underneath. This isn’t an entry-level goat’s cheese as there’s certainly a tang of the buck about it, although not offensively so (if you’re offended by such things). It’s very creamy with a citrusy tang to it, as well as that slight goût de Billy. It was a nice cheese to eat in chunks and also melted happily in a mushroom omelette. With additional research from Neal’s Yard Dairy, Culture and Portrait of the Artisan. I laughed when you said that we’d have to wear special glasses if this cheese truly gave a 3-D taste… Although I’m trying to wrap my mind around that! I’m totally willing to wear funny glasses just to experience that just once!! Another great cheese story, and under such duress… Hope you’re lot has improved. Oh I’m okay really, thanks. Just tired and moany! I hope you’re feeling a bit better now, I love the idea of feeling guilt from an uneaten cheese. When I wrote about Dorstone a few days ago and you almost immediately responded that “you were nibbling on a bit right now”, I thought WOW! – you must have an amazing fridge full of cheeses! How funny that you were also planning a Dorstone blog! But aren’t they great? Had a ‘deli supper’ last night of Dorstone and smoked salmon – a very fine combo…. Haha, I like the idea of an amazing fridge of cheeses, stocked with everything you could think of…I’ll keep that one in mind if we ever get round to an extension 😉 Yes, it must be Dorstone blogging week…it is a nice cheese. Haven’t tried a goat’s cheese with smoked salmon before – have a weird thing about cheese and fish together but that does sound good! Interesting that you thought it wasn’t entry level goat, as I’m quite a goat wuss/newbie. Maybe yours was more mature, yours does look a touch more gnarly than the one I had… or perhaps having mine on the same cheeseboard as some robust Stichelton caused it to quail in comparison… And the World Book Day costume sounds amazing – fine work! Maybe your goaty tolerance levels are rising! I did get it from NYD who sometimes age things for a bit longer so maybe it had gone a bit goatier over time. Robust Stichelton sounds good…whenever I’ve tried it I still (whispers) prefer Colston Basset Stilton, shock horror.